Due to the physical exertion required, cycling was an activity thought unsuitable for women. The symptoms of bicycle face could include "a wearied and exhausted look, flushed or pale skin tones, drawn lips, clenched jaw and bulging eyes with dark shadows." At the turn of the century the bicycle afforded many women increased freedom and autonomy, and the bicycle itself became a symbol of women’s emancipation. With the ridiculous prognosis of "bicycle face" we saw how cycling, feminism, patriarchy and medical opinion collided in the1890s. Photographer Marc Bernhard says, "The purpose of BikeFACE! is to promote and celebrate women’s commuter, recreational and sport cycling. 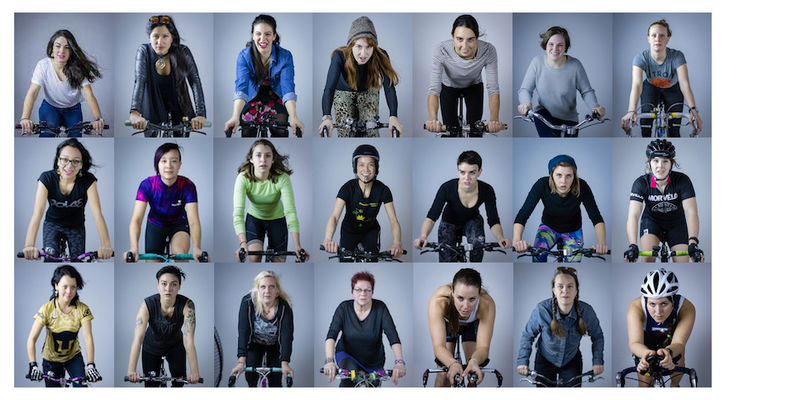 It is a series of studio images in which the subjects were invited to ride their bikes on a stationary trainer at full exertion to see what their bicycle face might look like. The series is meant to be a light-hearted, tongue-in-cheek reference to the historical anti-feminist ideas against cycling, by showing the strength, intensity and determination of women cyclists today." dandyhorse is pleased to present this essay celebrating women cyclists in our city -- just in time for Bike Month! You can read more about "bicycle face" here. We will be rolling out these BikeFACE profiles over the month here on dandyhorsemagazine.com in celebration of Bike Month, women and cycling. As they go live, links to each individual profile will be added below.